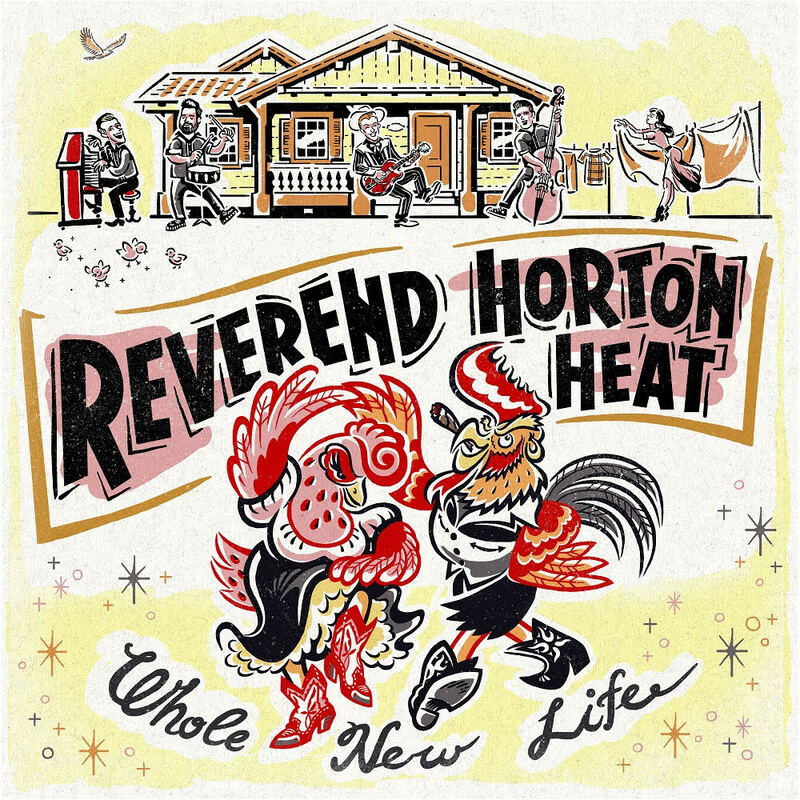 Whole New Life is the title of the Reverend Horton Heat’s 12th album, but it is also a fitting description for this new era of the band. Having started the band in 1986, with bassist Jimbo Wallace in the fold since 1989, Jim Heath’s psychobilly outfit has remained peerless since the release of their 1990 debut album Smoke ‘Em If You Got ‘Em. Last year, longtime drummer Scott Churilla departed the band, opening up Heath and Wallace to explore new possibilities. With the addition of jazz trained drummer RJ Contreras and pianist Matt Jordan, the band, indeed, has a whole new life. Of course, rockabilly will always be their heart and soul, but on Whole New Life the band reaches into elements of swing and Americana in ways that seem both obvious and long overdue. The opening, and title track, is the perfect introduction to this new incarnation of the band. A dance-y number with a great sing-along chorus, the song features a great guitar solo that is followed by an equally great piano solo from new guy, Matt Jordan. Likewise, “Got It In My Pocket” and “Sunrise Through the Power Lines” possess that same dance-able swing. Sometimes, the combination of a lightning-in-a-bottle moment and studio recording quality deliver something truly transcendent. If ever in the history of the Reverend Horton Heat this holds true, it can be evidenced in “Hate to See You Cry.” This is one of the best recordings of Jim Heath’s vocals. Indeed, as the press-release for the album states, Heath was particularly focused on his singing for this album. The fifth track, “Don’t Let Go Of Me,” slows the tempo down for a moody and plaintive song that also highlights Heath’s vocals. “Ride Before the Fall” is an instrumental track that puts the bands musicianship at the forefront. Indeed, sometimes vocals aren’t necessary when you can piece together an instrumental track that doesn’t need a lyrical narrative to remain compelling and provoke the listener to stand up and shake their hips. Matt Jordan’s piano playing also highlights “Tchoupitoulas Street,” an ode to the rich history of New Orleans. On “Wonky,” the band aims for pure rock n’ roll, in the vein of Little Richard, with a guitar-riff driven song that calls back to the artists who have long inspired Heath and his band. Few artist make one of their best albums this deep into their career. But, the Reverend Horton Heat have succeeded in delivering a truly great album 30 plus years since their first gig. Across 11 songs in less than 40 minutes, Whole New Life will inspire you to both dance and spin it again once it ends.